Chet Huntley, Big Sky, Montana, late 1960s. Saco, Montana—the kind of place where you step off into eternity and wonder if you will ever make it back. Situated along the Hi-Line, the land lays flat and scrubby, never a look to be confused with natural beauty. A roughneck town of only a few hundred, Saco is also home to the Chet Huntley schoolhouse. During the 1950s and ’60s, tens of thousands of Americans tuned in every night for The Huntley Brinkley Report, as Chet Huntley and David Brinkley delivered the NBC evening news. With their signature Good night, Chet / Good night, David, and a delivery style characterized by relaxed confidence and understated authority, they were considered the finest newscast team on television for more than a decade. Born in the Northern Pacific Railroad depot living quarters on Dec. 10, 1911, in Cardwell, Mont., Huntley progressed from “the middle of nowhere” to living rooms across America, through a persona bred of the Montana landscape, hard work, and persistence. His father was a traveling railroad telegrapher. The Huntley family had taken up homestead farming 15 miles north of Saco, in the Milk River Country, for about eleven years beginning in 1912. Saco, then a small town of 425, was about 160 miles west of the North Dakota border, and 40 miles south of the Canadian border. Within a mile of the Huntley farm, the Huntley School was built. Chet started his education there. The student body, all in one room—first through eighth grade—numbered about a dozen. In 1920, when the family moved into Saco, and he was enrolled in the school, 200 children attended in varying shifts, Saco’s population having boomed due to homesteading. The Huntleys sold the Saco farm in 1924. In 1928, Chet worked for the Whitehall State Bank as a teller. The Huntley family would live in various southern Montana towns: Big Timber, Norris, Pony, Whitehall and Bozeman, to name a few. Huntley attended college at Montana State University and the University of Washington. Beginning his broadcast career in 1934 at KPCB radio, 710-AM (now 50,000-watt KIRO), one of eight radio stations in Seattle, Huntley earned $10 a month. He received his crucial breakthrough as a CBS radio newscaster in the 1940s, then moved to ABC in the early 1950s. In 1955, he joined NBC and David Brinkley for the popular Huntley Brinkley Report. Airing for 14 years, Huntley-Brinkley won seven Emmys, two George Foster Peabody awards, and during the 1964 political convention achieved record breaking Nielsen television ratings. Despite an exceptional career in broadcasting, Huntley is also associated these days for conceptualizing construction of the Big Sky Corp., a then $20 million skiing and real estate development south of Bozeman. Huntley formulated the notion of “Big Sky” in 1968. He retired from NBC in 1970 to administer development of Big Sky Inc. Arnold Palmer designed the golf course at Big Sky. Industrial behemoths such as Chrysler Realty Corp., General Electric Pension Fund, Burlington Northern, and the Montana Power Co. provided financial support for tennis courts, a golf course, an air strip, indoor swimming pools, a dude ranch, ski runs, a shooting range and condominiums. The original Big Sky Inc. met opposition: many Montanans didn’t want unspoiled public land transformed to a resort. Huntley was paid a slice of stock (0.77 percent) for staking his reputation behind the development. He was at the forefront of the development, and his support was obvious. 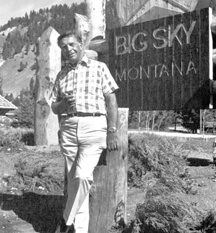 He cajoled two Montana governors, obtaining permission for the resort to make use of the state’s nickname, Big Sky. Raising the usual concerns about development, area residents and environmentalists protested the construction. But Huntley pressed on, convinced Big Sky would bolster Montana’s economic future. He garnered support from state and federal agencies and members of Congress. He flew around Montana, delivering his sales pitch to ranchers and farmers in small towns. He shook hands and made promises of better days ahead. He found customers who purchased condos. With assistance from investors, he secured more than 11,000 acres for the year-round ski resort and recreation center on the West Fork of the Gallatin River. Huntley, though, died before the resort staged a grand opening of its ski lifts in 1974, and exerted little influence over the finished product. A heavy smoker, he died of lung cancer three days before the celebration. Boyne USA bought Big Sky two years after Huntley’s death. In 2013, Big Sky Resort and Moonlight Basin merged together to form the largest ski resort in the United States with over 5,800 acres, over 250 named runs, and 4,350 vertical feet. While to some Bozeman’s proliferation of new housing and big box stores resembles a Denver suburb, Saco, like an old shoe covered in dust, forgotten in a closet, feels like a place stranded in time. Saco got its start in the 1880s, as a place to store a Great Northern Railroad water tank. Standing here, in the present, one makes an immediate assumption, that nothing has changed here since. The Chet Huntley schoolhouse evokes an insightful image of the times when he attended class there, the relic of a schoolboy who afterward successfully navigated the game of life to the heights of national prestige and influence. He is a man who left two separate legacies—one in broadcast journalism and the other imprinted on the recreational history of the state he loved and proudly called home. “Be patient and have courage—there will be better and happier news some day, if we work at it,” Huntley said on his final broadcast. Note: The Huntley School was moved to Saco and restored in 1968 by the Saco Garden Club.